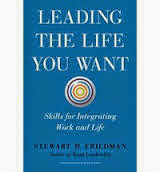 Another excerpt from the new book "Leading the Life You Want: Skills for Integrating Work and Life," by Stewart Friedman of the University of Pennsylvania Wharton School. This shows how Tom Tierney (whose story was begun in our prior post) used his journal to help incubate his idea for the nonprofit company Bridgespan, which he eventually cofounded. In a [journal entry] from 1988, for instance, Tierney - who was then running the San Francisco office of Bain & Company - wrote about what he called a "Make a Difference Company." The idea percolated in Tierney's mind and kept surfacing in his journal [emphasis mine] until 1999, when Bridgespan was born. If you journal regularly, Ideas, plans, concepts that are important to you will continue to pop up in your entries. A yearly review can unearth these patterns and keep ideas alive until the time is right to pursue them - in Tierney's case, this was more than 10 years.